Special Skills or Talents: Being the 'son' of the Caliphate and a religion that treats the flaming sword as a sacred symbol, he performs as an expert fire eater/dancer/resister and can do numerous impossible things with his saif swords. Strangely, though, he's also a fast swimmer and a great help with loading cargo. Oh, and he can grant wishes and do magic. Role in Carnival and how it relates to the history of your character: He's a horse whisperer, fire eater/dancer/resister, sword performer and all-around magician. 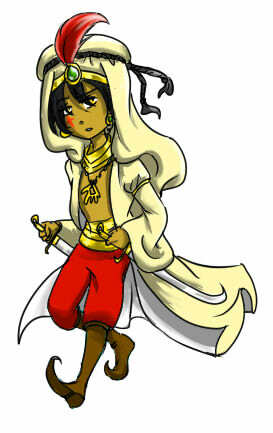 (Due to his djinn blood. )Apparently, the Carnival was a chance for Khalil to travel around the world, so he joined in. This is also going to be a reason on why he's the most Westernized among the Saudi cities. And being a djinn (djinns are supposed to have good memories) he remains one of the very few unaffected by the false sun's explosion, so he'll probably be a key character in the restoration of some of the other carnival folk's lives. Special personal items: His two saif swords, a sketchbook (he's been starting to get into art by this time) his Hasma necklace ( hand-looking symbol, important to both Jews and Muslims) a white bandana(he wore this back in WWI) an old kheffiyeh and four hoop earrings. 2. Unlike his father's, his hair curl kind of enhances his hearing. 4. He's trying to be less commando and being nice, but every now and then, his yangire side shows up. 5. Like all good Muslims, he loves cats. And like all Arabs, he also likes horses, camels and eagle-hunting. 6. Because of a sweet tooth, he's in love with chocolate. 7. Since he's still trying to explore the world abit in this AU, he gets this "OMG! I didn't know THAT!" face. 9. BECAUSE he's an Arab. never let him near an automobile; otherwise, he'll "play" with it. Even though his father had became immaculately rich after the first World War, Khalil grew curious. Curious of the world he didn't bother to explore since the Caliphate. But now he has the money to do JUST that. Unfortunately, he didn't want to explore it as some guy with loads of money, getting attention for the wrong reasons. So this is what he did: he went to his father and asked if he could travel around the world in disguise. At first, the Arabian was against this, but after a few days, he decided that this could be a hermit's journey for the young man. So after packing the necessary things, having his father arrange the trip to Europe (where, at the time he decided to join, both the Carnival Mistique and the Ragtags were) and patched up his disguise(he figured he could do more travelling if he became a performer of some sort, and named himself "Jannat' Adn" for "flaming sword"), Khalil was off. Eventually, though, he found out that something was wrong with the people around, and not just the Ragtags; alot of them were nations, cities, provinces, and a kind of people, but they their being was the ONE thing they couldn't remember in their lives. He was puzzled by this, but then he recognized some of the people in caravan. (And, apparently, the Carnival Mistique.) But the Mystique have gotten their eyes on Khalil; his talents and powers have been considered an advantage to anyone who knew of them and would want to use them to uplift their circus, particularly for the ringleader's hat. Most of the Ragtags don't know, but either way, they're overprotective of an important speculation like Khalil. And this is how what was supposed to be a trip to knowing the world turned into a pschologically complicated mission for Khalil: to help ALL the people without djinnblood to remember who they were before the ship of his sunk, while he tries to survive life in the circus. And soon. Well they will remember through there dreams, so I wouldn't try being to forecful with trying to make them remember when they will do it on their own however he would make for a good catalyst for some of the more stubborn ones. Also you can place him in Mistique if you wish.